The Sealaska Heritage Institute has selected Lance Twitchell as the recipient of the annual Judson L. Brown Leadership Award. Twitchell, whose Tlingit name is X'unei, is an associate professor of Alaska Native languages at the University of Alaska Southeast. He was part of the group that pushed to make Alaska one of two states to officially recognize indigenous languages, the other state being Hawaii. 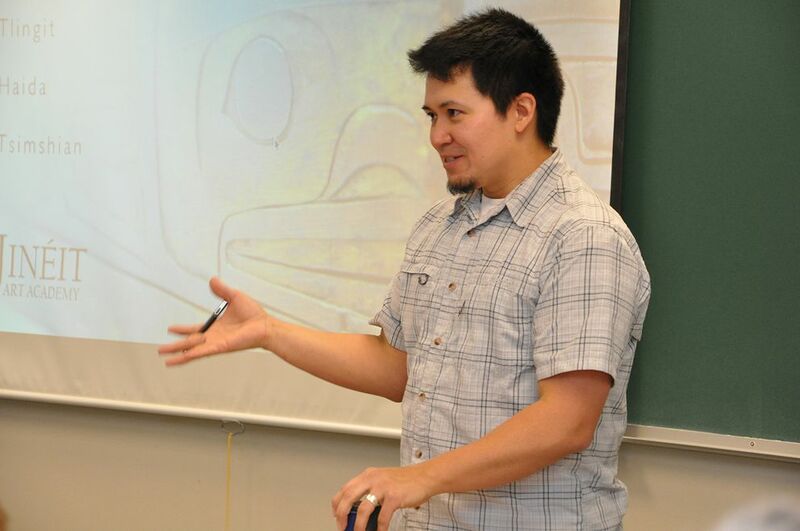 His efforts on behalf of the Tlingit and Tsimshian programs at UAS are credited with bringing about a 150 percent increase in attendance in Alaska Native language classes. Last year, Twitchell was accepted into the only indigenous language revitalization doctorate program in the world at the University of Hawaii Hilo. He plans to use the techniques and practices established in Hawaii to increase the use of Alaska Native languages. To that end, he's using his own family as a model. "He is teaching the Tlingit language to his children at home," Sealaska Heritage Institute President Rosita Worl noted in a press release, adding that he's also helping other parents do the same. "For the first time in many, many years we are witnessing the existence of bilingual children who speak their Native language along with English." The $5,000 award is given to one individual each year, paid for by an endowment created by Chris and Mary McNeil. It is named after the late Judson Brown of Haines, an important Tlingit leader and also the first Alaska Native ever elected as mayor of a majority-white town. He was the uncle of Chris McNeil, who is a well-known attorney. While Brown was famous in the realm of politics and business, he was also a passionate advocate for education across all ranks of society. That interest is reflected in scholarship administered by SHI that have amounted to $416,000 this year. Prior to her death in 2015, Alaska artist Rie Munoz spent five years writing stories about her life, from her childhood in Europe to her youth in Los Angeles, her service in World War II and her little jaunt to Alaska that turned into a life of adventure and art. Her son Juan said she wrote down the stories not just to relive her life, but to keep her mind sharp. "Many of the stories I had never heard," he said. The entire memoir is now posted at riemunoz.com and should make for entertaining reading, even for those who know nothing about Munoz's art, if there are any such people in our reading audience. National Arts Strategies, a national nonprofit group that trains art administrators in ways to keep their enterprises solvent and relevant, has selected Anchorage Museum director Julie Decker as one of 50 arts CEOs in their Chief Executive Program. The program focuses on how to manage change in arts organizations, communities and the cultural field at large. The Homer Council on the Arts is planning a Day of the Dead-themed art show for October. Submissions are due by 5 p.m. on Saturday, Sept. 10 and the art should be delivered on Sept. 23. The show will open at the HCOA Gallery on Oct. 7. Information and submission forms are available at homerart.org. The Alaska literary and art journal Cirque is taking submissions of poetry, prose and images (also ad purchases) through Sept. 21. Send your best work to cirque.submits@gmail.com or find out more, including full online versions of previous issues, at cirquejournal.com. A reminder that photos by Joe Kashi are on display at Great Harvest Bread in Anchorage this month. Proceeds of sales will help support the magazine.